Earth Day is the new “It” holiday, as evidenced by the overwhelming number of eco- and family-friendly celebrations this week. It might have something to do with parental guilt over their family’s carbon footprint, or maybe it’s just a good way to help kids celebrate the world they’ve inherited. Either way, here are some—but by no means all—of the places to party, make crafts, learn green tips, and dance, all for the love of the globe. 4/19 and 4/20, 10:30 a.m. to 4 p.m. The zoo (enter at 65th St. and Fifth Ave.) has two perfect ambassadors for Earth Day—polar bears Gus and Ida. Kids will learn how to help save their habitat, witness “bear events,” and take in a show on tamarin monkeys. Enjoy decorating canvas bags (to be used henceforth instead of plastic) and Earth Day bingo. 4/19, 1 to 4 p.m. The West Village’s “backyard” (a.k.a. Pier 45 at Christopher St.) fêtes the Earth with an oddly Easter-y “eggstravaganza.” There will be an egg hunt, egg dyeing, and egg relays, plus fishing (the river’s doing well! ), game stations, more crafts, storytelling, and face-painting. The Hudson River Ramblers provide live music. 4/19, 11 a.m. to 4 p.m. Behind the Field House on Lorimer St., celebrants can participate in a slew of free activities: workshops on how to write and design posters about recycling, crafts with recycled materials, street-tree landscaping, judo and yoga demos, and a scavenger hunt. Local schools will present educational programs, while community groups offer green info. Merchandise will be ecofriendly, naturally. 4/20, noon to 4 p.m. The Central Park Conservancy and the Green Apple Festival observe the day by planting, mulching, composting, and caring for trees. Enjoy face-painting, crafts, and music (bluegrass artist Ricky Skaggs, South African singer-songwriter Vusi Mahlasela, and Brooklyn-based singer-songwriter Vienna Teng). BYO picnic. 4/19, noon to 5 p.m. The museum’s unorthodox Earth Day celebration focuses on nesting season. Momma Sassafrass the Sea Turtle is looking for a safe place for her eggs. Children use clues to find the eggs aboard the tall ship Peking. They can also listen to stories, do some crafts, and meet animals living in the Harbor Wet Lab. 4/19 and 4/20, 1 p.m. The city’s excellent transportation museum puts on interactive demonstrations showing the many environmental merits of public transportation. Yet another reason to love the subway. While there, visit the “Clearing the Air” exhibit. 4/19 and 4/20, noon to 4 p.m.
Bring an old cell phone to recycle at the aquarium’s “Seas the Day” green fest. Kids can create more canvas-bag art, plus crafts from recyclable materials. Exhibits and vendors both will help educate families about how to protect the planet. 4/19 and 4/20, 12:30 to 4:30 p.m. Families can learn everything they wanted to know and more about composting at this Queens destination. Games, puzzles, and workbooks inspired by the BBC’s miniseries Planet Earth will be featured, and its premiere episode, “Pole to Pole,” will be screened. 4/22, 12:30 to 3 p.m.
Storytelling (from environmentally themed children’s books, of course), craft projects, and community activities are the things to do at this Queens nature mecca. 4/19, 10 a.m. to 3 p.m. 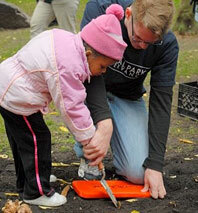 Prospect Park’s Youth Council pitches in by gardening, weeding, and reconstructing flower beds and veggie gardens. Discussions of holistic remedies and what families can do to reduce waste and conserve energy round out the day.